190 Watts, 8' x 9.5'ft. 1 kW, 22' x 20' x 11'-14.5'ft. 2 kW, 40' x 22' x 12'ft. 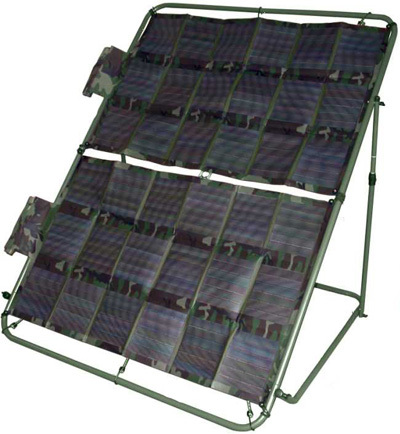 Energy Technologies offers a range of solar accessories to support your solar panels. Collecting the maximum sunlight in your solar panels requires angling of the panels toward the sun. This solar frame allows the portable panels to be set up and angled as needed. Copyright © 2000-2019 Energy Technologies, Inc. All Worldwide Rights Reserved. are registered trademarks of Energy Technologies, Inc.
Request a Quote or Product Info.